POVCOMP 2004: Viewing Page for "Pathways"
This work features multiple layers of non-periodic tube patterns with tiny spheres scattered throughout. This work features multiple layers of non-periodic tube patterns with tiny spheres attached to the tubes throughout. The variety of colors adds excitement to the work while the deep shadows provide a sense of the mysterious. This image was inspired by a SIGGRAPH paper that I read a while back about the use of non-periodic tiling patterns in 3d imaging. 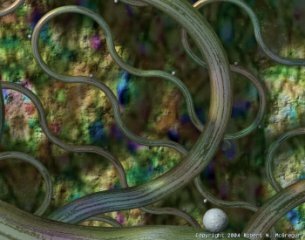 The main idea for this piece was to allow POVRay to generate the scene composition based on a few simple rules by using non-periodic tiling of cubes containing two 90 degree slices of a torus. In a macro I set up an XY grid of these cubes, each rotated randomly either 0 or 90 degrees on the Z-axis. This simple trick (derived from work by a 17th-century Dominican monk named Sebastian Truchet) yields an intricate pattern of infinitely non-repeating, non-intersecting tubes. For some additional eye candy, a sphere is placed on the surface of each torus section within each cube in the cube array, and these spheres are randomly rotated along the torus surface to give a more natural flow to the overall composition. The background plane is textured using an abstract and very colorful image map pigment with an averaged granite normal. 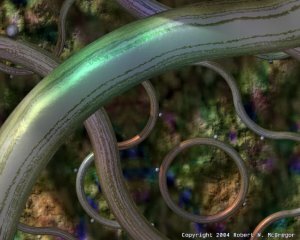 For the tube pigment I again used the background image map. This reuse of the image map as both normal and pigment throughout the scene really ties everything together into a cohesive whole. The spheres use a similar texture. The final touch is my use of the golden ratio for the image size, giving the overall composition a pleasing sense of classical proportion. The deep shadows cast from the multiple layers of tubes onto the background plane add a sense of mystery to their intricate, colorful, and delicately pleasing geometries. 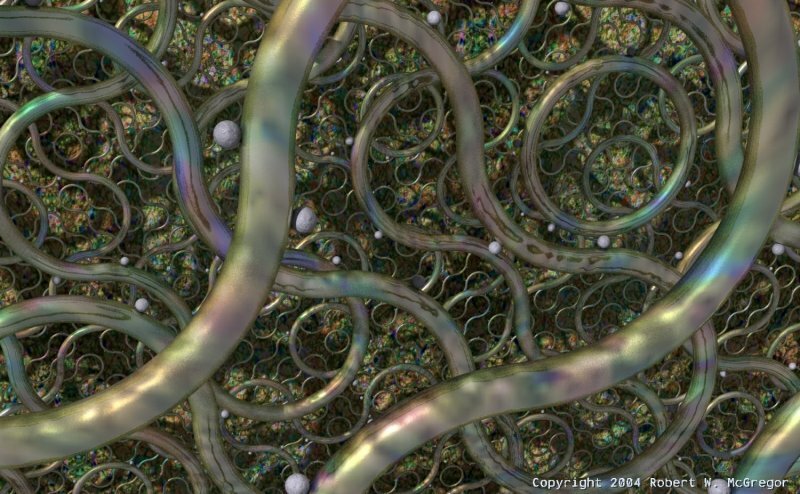 Photoshop to create the abstract, colorful image used for bump mapped normals and image mapped pigments. Good, nice abstract shapes and textures, but why the background? This picture would have been awesome with more depth.